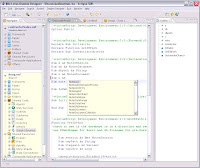 In a DDE (Domino Designer in Eclipse) meeting yesterday, when I was talking about how important it was to separate the client and designer processes at this time, Andre asked what I had in mind for private in desktop views... Part of the solution for separating the processes means a separate workspace/desktop for the Designer client, so that does indeed present a challenge for private in desktop views. Driving in this morning (since I had to drive in by myself, and could be relaxed rather than clinging to the armrest because Steve doesn't like to brake as early as I do, but that's another story), I had the thought that we could probably get away with editing such views only within the context of a client. It is my belief that most of the users/editors of such views are those users who have an ACL access where they can create views, but do not have design rights to the database. They do their view design in the client anyway. So I am seriously considering removing the ability to create private in desktop views when in the Designer, and only providing that function if you are editing a view in the Notes client itself (we'd probably have to have some UI to open the design in the client then even if you had design rights). The alternative for all this is some kind of replication between desktops. Is my belief correct that that is the predominate use case for that kind of view? If so, I am leaning hard towards having them be client only. Anyone think that's a terrible idea? We're trying to prioritize some tasks for LCD, and I could use some help. Is it important to you that LCD build Notes client applications? If so, do you plan to predominantly use Domino data in them, or would you want to use LCD's onboard XML document store, or both? If you would need the XML document store, would it be ok or not to wait for offline access to that data from the client? There's more to do for sure, but it's fun and moving forward!!!! We took the train from Prague to Dresden, negotiated the Metro several times, including a final ride to get from the wrong train station to the right one... Who knew? Drifting off to sleep, but so far a great start to the DNUG adventure! Tomorrow night I fly out of Boston on my way to Dresden for the DNUG conference. I am giving one presentation on Domino Designer (yes, there's some neat new stuff to show!!! ), and Martha and I are doing a talk on Lotus Component Designer together. New stuff to show in LCD, too :-) Enough to make me lug two laptops across the ocean! On our way there, we're stopping in Prague - which I have heard is an intriguing city. Hoping to see Prague Castle and get a new stamp on my passport! Georgia delivered four puppies this morning! Three liver males at 7:00am, 7:30am, and about 8:10am, followed by a liver female around 9am. Mom and pups are resting comfortably, Julie (Georgia's breeder and other owner) is exhausted! Pictures as soon as I get one!